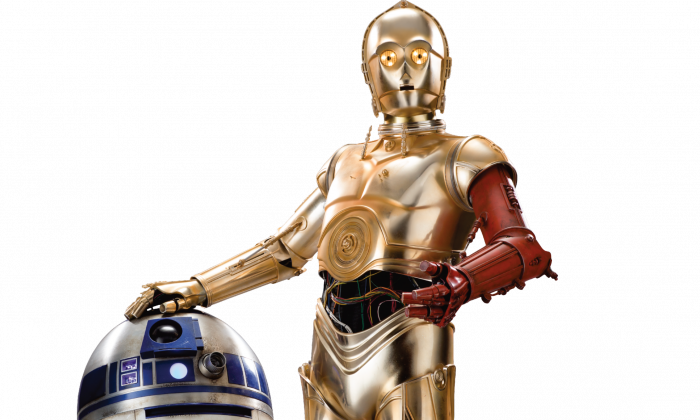 Artificial intelligence (AI) has been around for a long time, and people are still waiting for the first C-3PO (a character from “Star Wars”) to be released. Looking at the money big tech companies and venture capitalists are pouring into the sector, AI is making huge progress, although the investors are looking for different things than a talking robot. “In the long run, I think we will evolve in computing from a mobile-first to an AI-first world. And I do think we’re at the forefront of developments,” said Sundar Pichai, CEO of Google Inc., on an earnings call with investors in April. Google is the most active investor in AI with nine acquisitions completed since 2011. In the long run, I think we will evolve in computing from a mobile-first to an AI-first world. — Sundar Pichai, CEO, Google Inc.
“High-quality AI engineers are in very short supply, and majors who have fallen behind the AI race (Twitter, AOL, and dozens of others) see what Google is achieving and are scrambling not to be left behind,” stated Victor Basta, managing partner at Magister Advisors, a London-based specialist investment bank, in a LinkedIn post. Artificial intelligence is based on the assumption that a machine or a computer can be made to “simulate” human intelligence. The term was first coined in 1956 when a group of American researchers came together at Dartmouth College to discuss how to program a computer so that it can act like a human. Technological breakthroughs in recent years broadened the application of AI. It is now used in a wide range of fields including computer science, health care, finance, security, advertising, telecom, transportation, and automotive. “We think artificial intelligence and, in particular, deep learning could be as profound and may be even bigger [than mobile and cloud],” Chen says in a video on Andreessen Horowitz‘s website. The interest in AI soared due to innovations in machine learning and particularly in the area of deep learning. Deep learning creates knowledge from multiple layers of information processing, and its applications can be found in functions like image recognition or speech recognition. In recent years, U.S. tech giants realized the importance of AI for their services and started pouring money into startups. The pickup in mergers and acquisitions began in 2014. Tech giants including Google, Twitter, Salesforce, Apple, Intel, Yahoo, IBM, and AOL bought nearly 30 AI startups in the last five years, according to CB Insights. Five of the acquisitions happened in 2016. Google paid $600 million for DeepMind, which recently beat a human world champion in the board game Go. One of the most notable deals was the acquisition of deep-learning startup DNNresearch by Google in 2013 from the computer science department of the University of Toronto. This acquisition helped Google improve its image search features. Another important deal by Google was the acquisition of the U.K.-based DeepMind Technologies in 2014. Google paid $600 million for DeepMind, which recently beat a human world champion in the board game Go. Twitter comes second after Google in acquiring AI properties, with four major deals since 2014. Twitter recently bought U.K.-based image-processing startup Magic Pony. According to media reports, Twitter paid $150 million for the 14-person startup. With a valuation at $10.7 million per employee, the deal “marks a high-water mark in AI for what is essentially a team acquisition,” stated Victor Basta in his post. “The U.K. is also an emerging hotbed for AI companies due to the influence of Cambridge, Oxford, Imperial College, and a crop of AI-active venture capitals such as White Star, Playfair, Notion,” he said. Apple and Salesforce joined the acquisition spree last year, and each acquired three AI startups since then. Facebook is also a big investor in AI but mainly develops the technology in-house. The company dedicated a lab to AI research in 2013 and hired experts in deep learning. The company uses AI in personalizing what matters to each user and populating their timelines with relevant content. Venture capital (VC) interest in AI boomed in recent years as well. The boom started two year ago as “2014 marked a banner year for VC investment in U.S.-based AI startups, with capital invested and deal count increasing year-on-year by 183 percent and 41 percent, respectively,” stated a report by PitchBook, an M&A database. 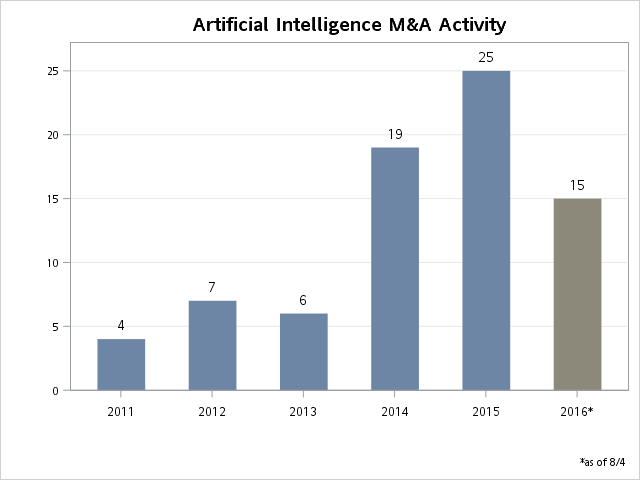 Artificial intelligence companies are acquired largely or entirely for their teams and capabilities. Their employees are traded like professional soccer players. AI may be the only sector in tech where pure team value now significantly exceeds the business value. “AI may be the only sector in tech where pure team value now significantly exceeds the business value,” stated Victor Basta in his post. According to an analysis done by his firm, Magister Advisors, the median price paid to AI startups per employee is $2.4 million. However, the buyers do not use this metric to value the AI startups; they will only use it as a cross-check to avoid overpaying. “The way these companies get valued is in price brackets generally. Larger buyers are prepared to pay $25 million to $50 million for capability and some tools rather than a real company with traction and future revenue potential,” Basta told the Epoch Times. Despite the demand, the AI valuations have not ballooned yet, according to Basta. “A $2.4 million value per employee is not anywhere near the high-water mark that is closer to $5 million per employee,” he said.